Tiger Woods says he is perfectly poised to end his five-year major drought and win a fifth Masters this week. Woods is favourite to win his first Green Jacket since 2005 and first major since 2008 after returning to world number one with three wins this year. He tumbled to 58 in the world in 2011 following his private-life scandal and injury and swing struggles. "I feel very balanced," said Woods, 37, who is now dating American ski star Lindsey Vonn. He added: "I feel comfortable with every aspect of my game. I feel that I've improved and I've got more consistent, and hopefully I can continue it this week and the rest of the year." Woods believes he can resume his quest to pass Jack Nicklaus's record of 18 major titles. "We have very expansive careers and I feel like I'm basically right in the middle of mine. It took Jack a while to get to 18, all the way until he was 46 years old. "I have a lot of good years ahead of me and I'm excited about this week." Woods also went into last year's Masters as favourite after winning his final outing at Bay Hill but slumped to a tie for 40th, his worst finish as a pro at Augusta. However, in every other year since 2005 he has finished no worse than sixth at the Masters. "I put myself in the mix every year but last year, and that's the misleading part," he said. "It's not like I've been out of there with no chance of winning this championship. I've been there, and unfortunately just haven't got it done. "I've made runs to get myself in it. I've been there in the mix on the back nine, either not executed, not made enough putts or didn't take care of the par fives, or whatever it may be." Woods says he is delighted to have overhauled Rory McIlroy as world number one, the 11th time he has topped the rankings after dominating the game throughout the last decade. "There are a lot of players who try to get there and have never been able to do it, and I've been able to get there a few times throughout my career," he said. "And to battle the injuries that I've come through and to get through all that and to win enough golf tournaments and to win consistently enough to get to that point is something I'm very proud of. "I'm excited that at this point in my career that I've been able to get healthy and to be able to give myself another chance." Phil Mickelson is chasing a fourth Augusta title after wins in 2004, 2006 and 2010 but admits he is nervous after taking the last week before the Masters off for the first time in recent years. The left-hander played alongside Peter Hanson in the final group 12 months ago but a triple-bogey seven at the short fourth dropped him back to a tie for third, his fifth third-placed finish at Augusta. "I think what makes the Masters so exciting is having an opportunity to win; playing the back nine with an opportunity," said Mickelson, who played golf with new Augusta member and former United States Secretary of State Condoleeza Rice on Sunday. "That is what is so enjoyable, exciting as a player. And I've been fortunate to come out on top a few years and I've been unfortunate to have a number of them come close but not quite good enough. "But either way, having that opportunity to be in the thick of it and to feel that excitement, to feel that pressure, to grace Amen Corner knowing that you need birdies and trying to win a green jacket, that is the greatest thrill a golfer can possibly experience." Mickelson is using a new club - dubbed a "Phrankenwood" - this week, a driver with a smaller head which uses the face technology of a three wood. Meanwhile, defending champion Bubba Watson broke down in tears when asked about what he did with his Green Jacket last year. The left-hander choked up before revealing he had wrapped his newly adopted baby son Caleb in it. "That's the only thing I did with it," he said, before pausing to wipe his eyes. "Out of respect and honour for Augusta National, as one of greatest clubs we have, as one of greatest tournaments, out of respect for them, I didn't do any of my funny antics that I normally would do." Is Woods ready to reign again? 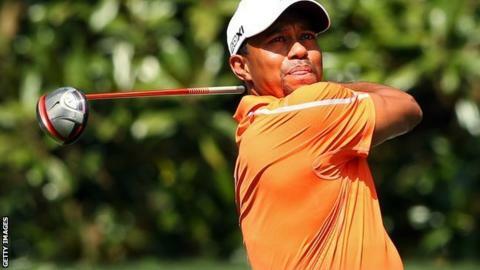 Read more on Masters 2013: Is Tiger Woods ready to reign again?